Valiant is proud to present an advance preview of Harbinger #6 – the FIRST issue of an all-new arc by New York Times best-selling author Joshua Dysart (BPRD: 1946) and rising star Phil Briones (Captain America Corps)! Out of the ashes of the Harbinger Foundation, the rise of the Valiant Universe’s first super-team begins on November 21st in the fearless first installment of “Renegades”! Peter Stanchek. Zephyr. Kris. Flamingo. Torque. The first battle against the Harbinger Foundation has been decided, but the war is just beginning. Join the resistance on November 21st in Harbinger #6 – the opening chapter of “Renegades” and a brand new jumping-on point for the series Comic Book Resources calls “one of the best things to happen to superhero comics.” The Valiant Universe is about to change forever…and it all starts right here. HARBINGER #6 – ON SALE NOVEMBER 21st! HARBINGER #7 – ON SALE DECEMBER 19th! 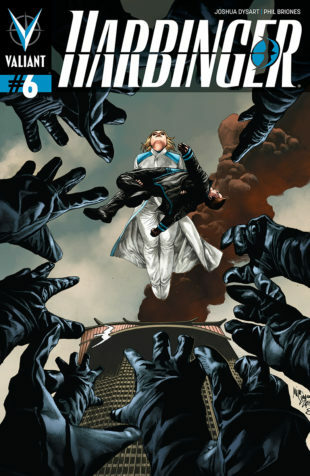 HARBINGER #8 – ON SALE IN JANUARY!